It’s what keeps our sanity. Our family functions like a well oiled machine. We each have our “assigned” tasks and chores and we rarely deviate from the path. Today, I decided to cook dinner and to do that, I would need to go to the grocery store. While this may seem pretty routine for the average person. It’s not really for ME. I am beyond lucky that not only does Clay do all the grocery shopping, he also does all the cooking. 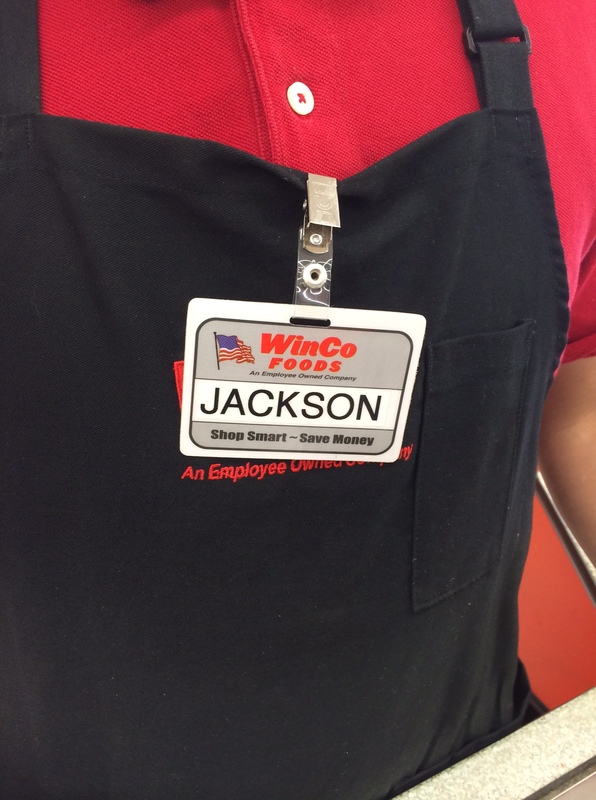 He can successfully navigate three stores every Saturday with both Jackson and Darrah and lay a bounty of well purchased goods on the counter upon his return home. He can tell you what sales will hit when and where to get the best deals. He has Darrah to help with Jack. And it’s a perfect arrangement. But, hey! It’s spring break. And I am feeling quite domestic. So what could POSSIBLY go wrong with me breaking Jack’s routine and bundling him into the car right after breakfast for a trip to Winco!? I will grant you that it certainly helped that it was early morning and there was not a lot of shoppers. I will also grant you that I was in a good mood given that THIS was the only task I assigned myself with nowhere to go but home when I was done. We walked the aisles. We chatted away. We sang Jackson’s “Annu Annu” song. Occasionally something would catch his attention and he would stop to ponder it. Some people stared. Alot of people smiled. 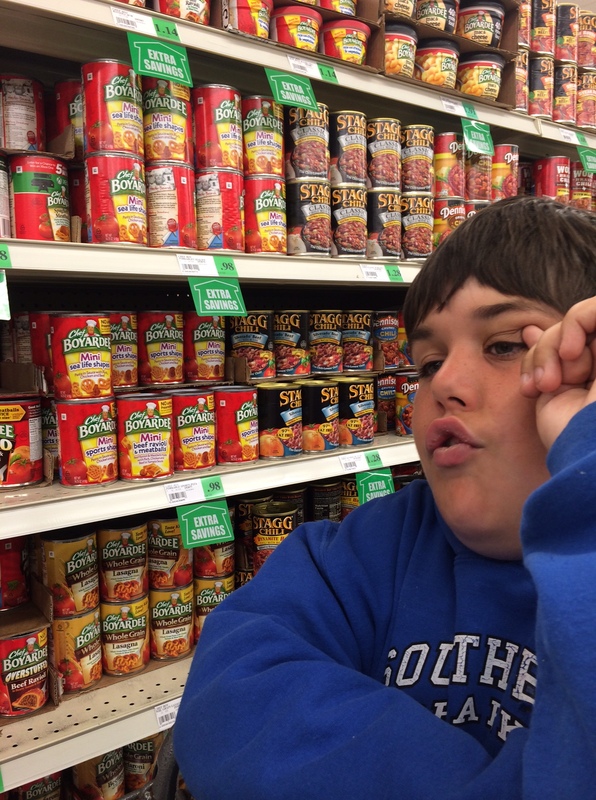 Jackson ponders the wide variety of canned beans offered at Winco. Jackson places the Tuna Helper box he had previously thrown on the floor. I feel ya’, buddy. That stuff is nasty. We took our time. We had fun. I let go of any expectations of what could possibly happen and I just let myself be there with Jack. 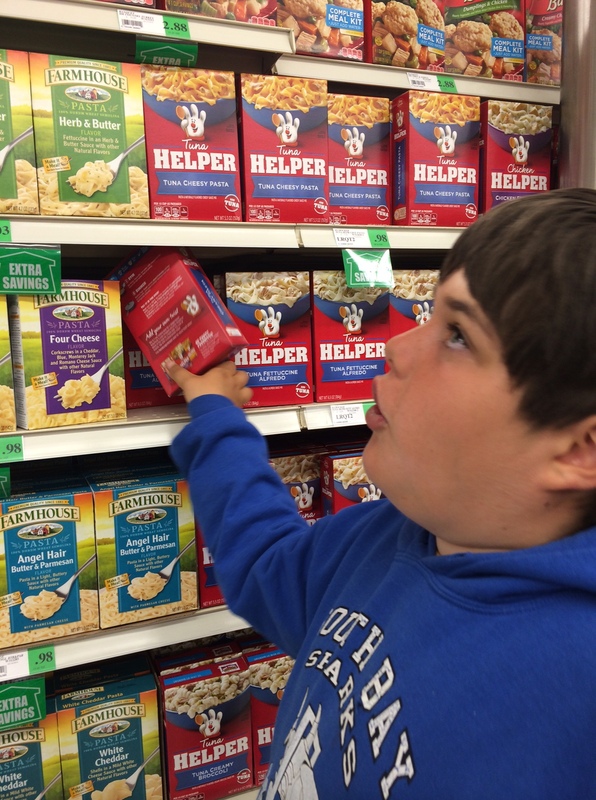 And so I got to thinking…..ALL the stress we put on ROUTINE in the autism community? Maybe we need to shake that up a little now and then. 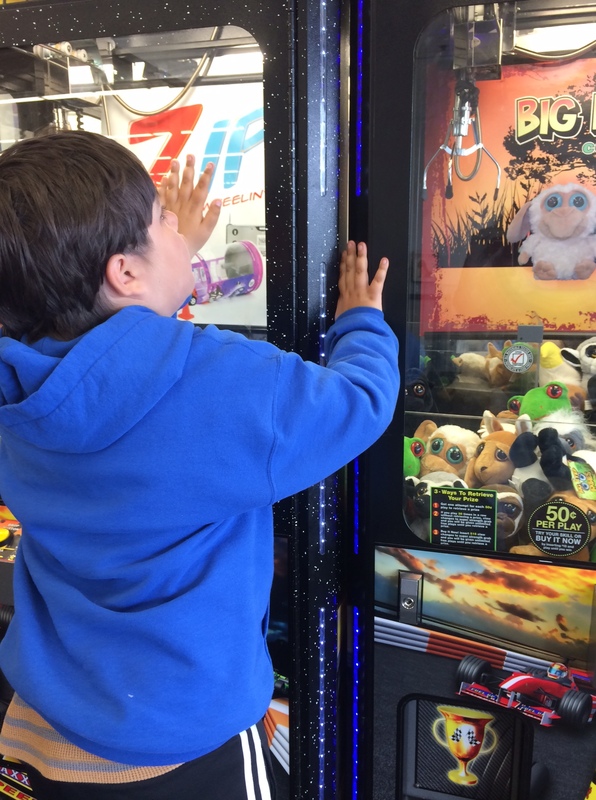 Maybe we need to trust our kids that yeah– they can handle it-if we let OURSELVES handle it, too. I can tell you that todays break from routine was a little slice of heaven. And I can’t wait to do it again. J A C K S O N! We had to stop and check out the lights on the way out. So April 2 was not only Autism Awareness Day…. I have mixed feelings about BOTH of these events. We pondered having a birthday celebration for Jack, but decided against it. Because it would not be for Jack. It would be for US. Like most other celebrations, it has no relavance, no meaning to Jack. To understand a birthday celebration, one must understand construct of time, the passage and the milestone aspect. but he’s a child and ALL children love presents, cake, ice-cream, and celebrations. And you would be incorrect. Jackson is quite at peace with himself. He finds joy in small things. He does not like to be forced to DO anything. And we save that for learning/teaching experiences. And WORLD AUTISM AWARENESS DAY? We’d like acceptance more than awareness….. But still I am not here to force an agenda on anyone. So lets get back to the celebrations. I thought long and hard about Jack’s birthday and what we should do. A traditional birthday party wouldn’t really work. And who would we invite? And forcing Jack to open gifts? Not his cup of tea. No….it would definitely be for US, not Jack. I am not a male. Nor am I Jewish. Nor am I 13. And pushed me through all the steps. And made me repeat words. 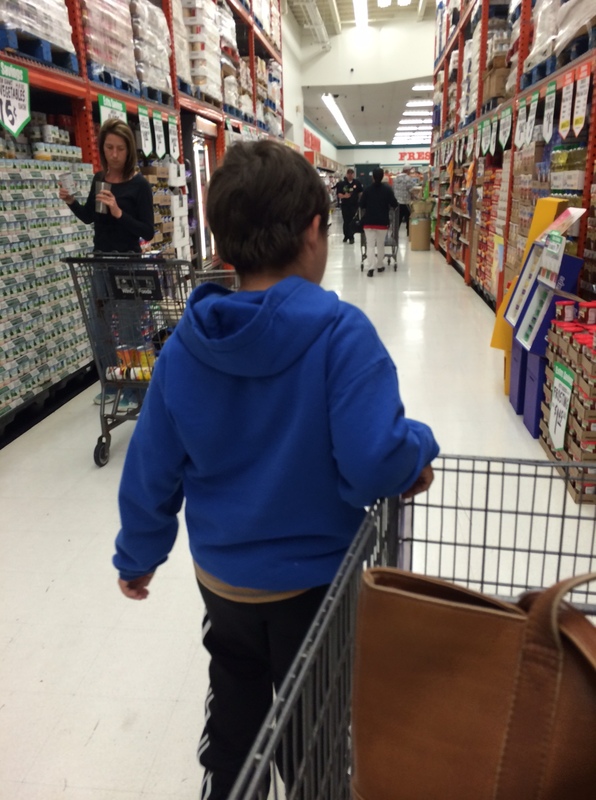 And walked me through it…. I wouldn’t know what the heck was going on, it would bear no relevance in my life, and it would probably annoy the heck outta me. This is how I see us forcing a celebration onto Jack’s day to day routine. Instead……we celebrate Jack every day. We celebrate the large and small. We celebrate seizure free days. And THAT, my friends, is more important than any artificial construct and sugary treats.